As I mentioned in a previous post, my bright idea for Christmas gifts was to make coordinating quilts for my mom and dad. Dad’s was shipped and arrived at the beginning of March. Since then, it’s been keeping him—and the occasional visitor—toasty warm. 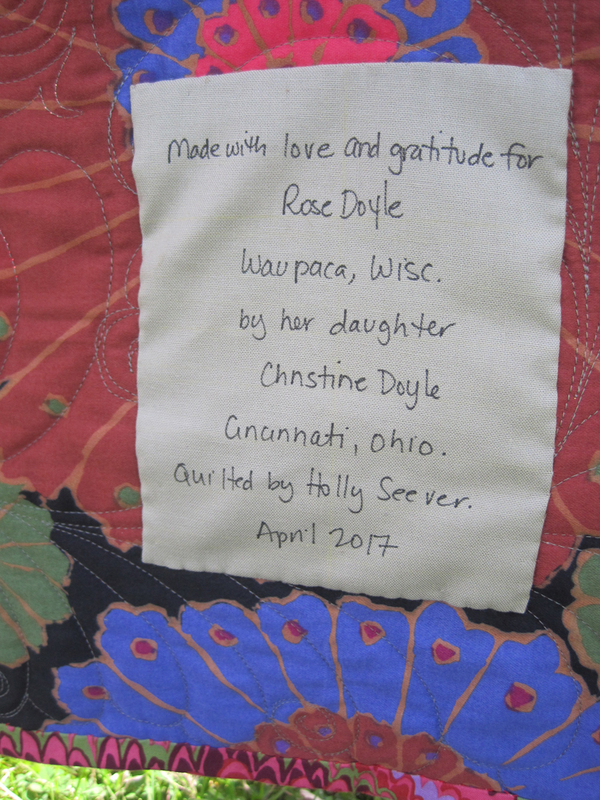 In April, I finished Mom’s quilt and delivered it to her in person. 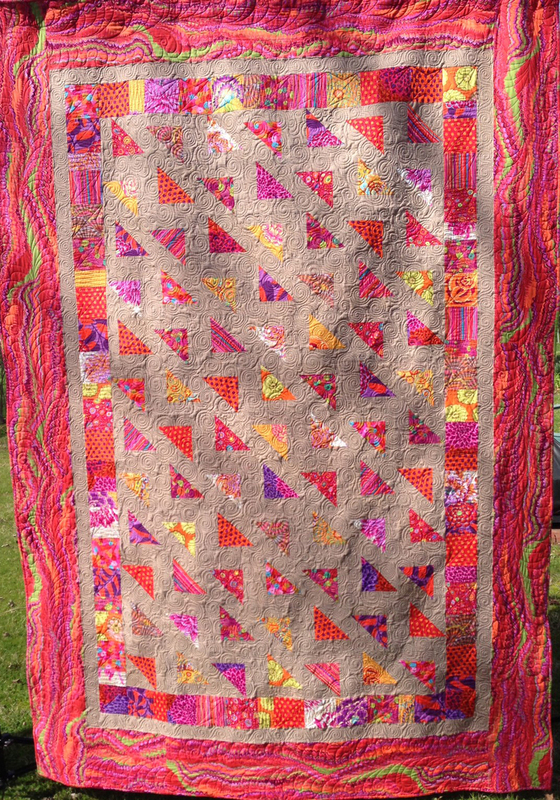 It’s the same pattern and has the same background as Dad’s quilt, but I made it with the Kaffe Fassett fabrics my mom loves. 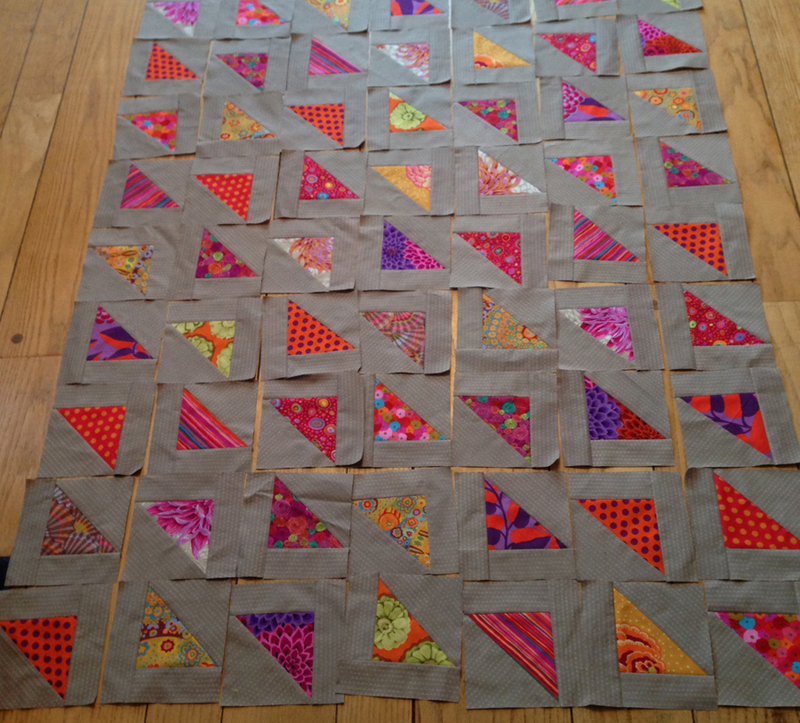 I actually started Mom’s quilt first, so I have some of process shots to share. The block pattern I used is Falling Triangles. The tutorial in the link starts with two 10-inch squares of fabric for the quarter square triangles, but I made mine with 8-inch squares, which resulted in 6-inch finished blocks once the additional background strips were sewn on. I made 84 blocks for the quilt center, 7 across and 12 down. With most of the fabrics, I cut just one 8-inch square, resulting in 4 blocks of that fabric. For other fabrics, I cut two squares. I didn’t end up using all the blocks I made, however. Many of the fabrics were pulled from my stash; I bought the two polka-dot fabrics, the stripe, and a couple others to round out the selection. 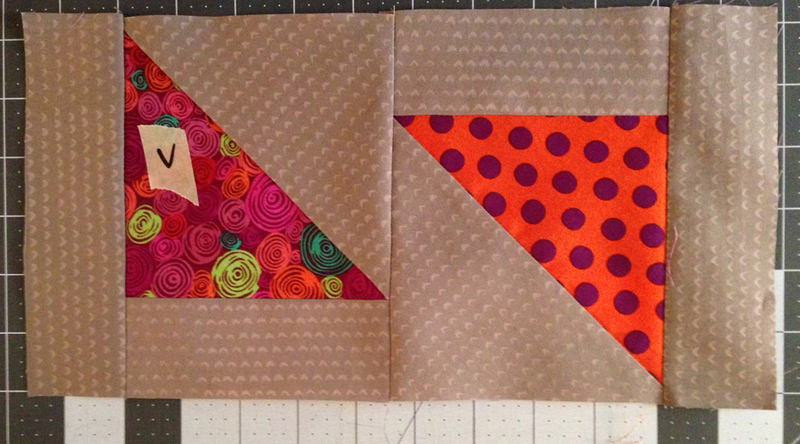 Once I had the layout set, I had a hard time keeping my triangles oriented correctly as I sewed. So I marked every other one with a V for vertical, which made sense at the time. 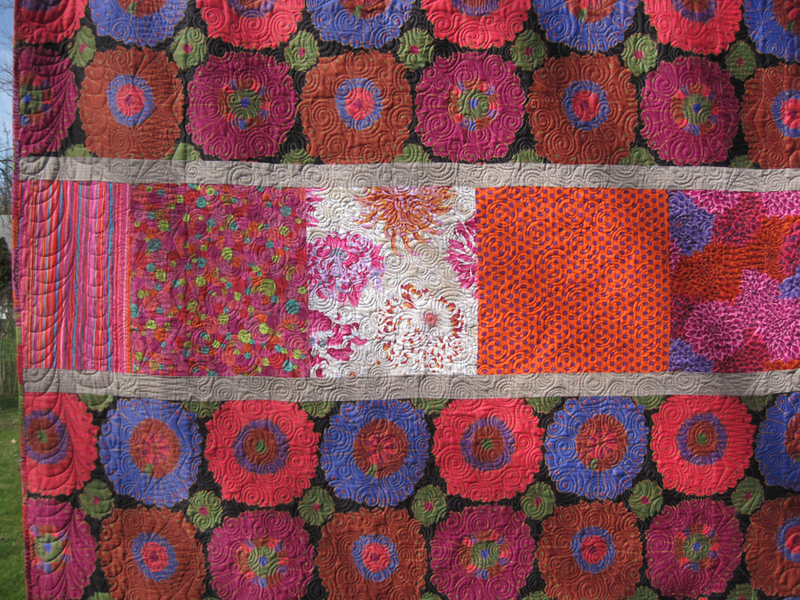 With the center sewn, I added a border of squares and rectangles using all the center fabrics. The math didn’t turn out right to have all 4-inch (finished) squares, so I threw in a few 2 x 4-inch (finished) rectangles to make it work. Next I added a border of the background to bring things down a notch. And then I amped it back up with the border fabric. It turned out so bright and fun! Rather than try to quilt this giant quilt (it ended up being about 70 x 100 inches) myself, I asked Holly Seever to longarm it for me. She and I talked a bit about what I had in mind, and then Holly came back with a plan. 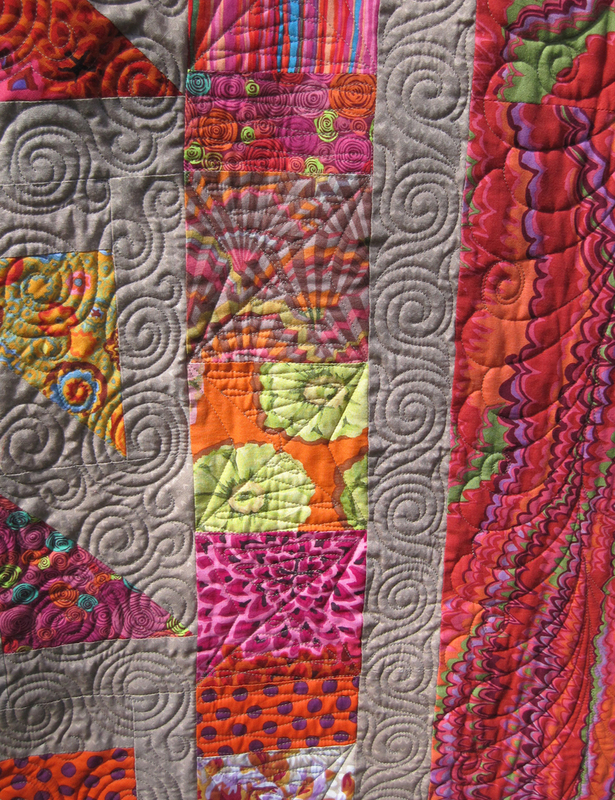 She quilted swirls with tails all over the center, Xs and figure 8s on the squares and rectangles, smaller swirls in the background border, and finally, feathers with swirls on the border. I bound the quilt with the border fabric. And, of course, added a quick label, too. 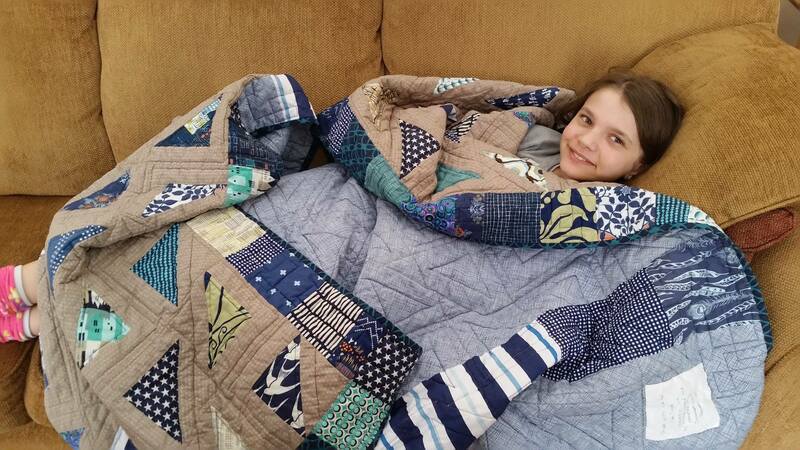 Even though Mom is a quilter herself, she appreciated having a quilt made just for her. And I enjoyed making it for her. 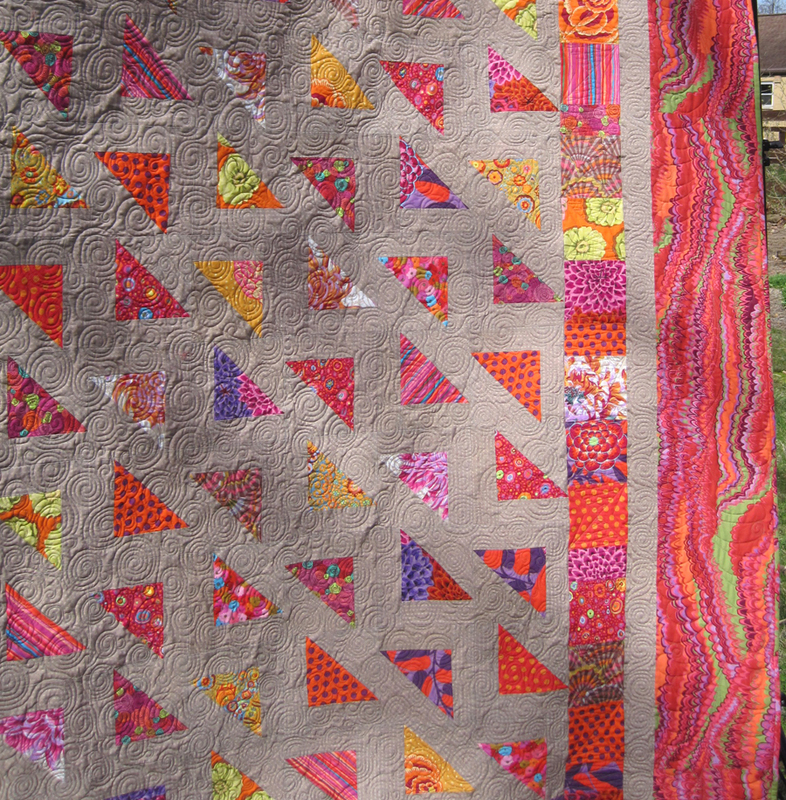 I had never made a quilt with fabrics from just one designer, so it was fun to see how well they went together even though they were designed years apart. Even the backing fabric has many of the exact colors as the binding fabric.